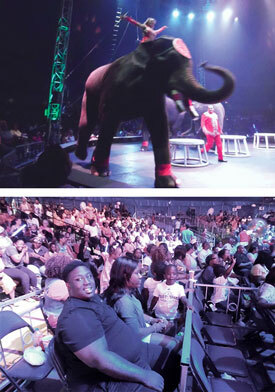 BALTIMORE - State’s Attorney Marilyn J. Mosby and her husband, City Councilman Nick Mosby, and their children were guest ringmasters on a Friday afternoon during the UniverSoul Circus stop in Charm City. Cedric Walker, the founder and CEO of the UniverSoul Circus, was born in Baltimore and attended Tuskegee University as did Ms. Mosby. She is a proud alum of the best known historically Black colleges and universities. The Mosby family came on as a pre-show that featured local acts, including child performers and young dancers, ended. 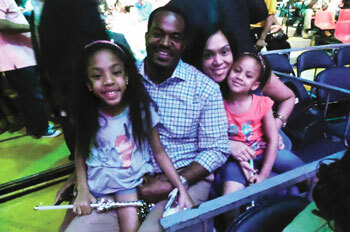 Baltimore State’s Attorney Marilyn J. Mosby and her husband Councilman Nick Mosby and their children were guest ringmasters on a Friday afternoon at the UniverSoul Circus stop in Baltimore. Ms. Mosby, as an achiever, was selected for an award long before fame arose surrounding the Freddie Gray case. Unrest erupted in the city and protests around the country following Mr. Gray’s arrest, takedown and his death a week later on April 19. Mr. Gray’s voice box was crushed and his spine was “80 percent severed at his neck.” Video shot by a bystander shows him screaming in apparent agony as police drag him to a van. The state’s attorney charged six officers in connection with the death for failing to get medical attention for Mr. Gray and failure to use a safety belt to secure him in a police paddy wagon. The officers have been indicted and Ms. Mosby should be lauded for her independent and courageous stance as a prosecutor. But at the UniverSoul Circus, she was trying to provide a living example and model good choices and behavior we say we want emulated—as part of a high achieving, loving and unified family. A family with a great mother, a great father and great children. Her appearance was in no way grandstanding. It was an embrace and inspiring message to our community and our children about the possibility for greatness we must strive for. So while she and her husband hyped the crowd, lip synched songs and were given an award, it was a family affair, a Black family affair at the Black circus. Don’t let the clowns fool you, Ms. Mosby’s circus appearance was a great thing for young people who need signs and people who show there is hope. It reflected the circus theme “Your Life Matters”—which is about us making our children feel treasured and inspired to do wonderful and positive things. No matter what the clowns say, Ms Mosby did a great thing for us. And I am sure her two children, with such hardworking parents, enjoyed a night out with mommy and daddy. It’s too bad that some are so evil and others are so misinformed that they take the words of evil ones and run with them. Nothing the state’s attorney does is going to please those who are after her, unless she betrays her duty—which I don’t believe she will do. She hasn’t done anything wrong, so she should not cower because the Fraternal Order of Police and defense lawyers aren’t happy with her decision and the mainstream media mindlessly repeats the false FOP arguments and creates a fake controversy. The state’s attorney was called “inspiring” and “down to earth” by a Black mother who brought her children to the Universoul Circus. Ms. Mosby proves you can be an ordinary person and you can take a stand for what’s right, she added. I think it’s our duty to stand with and defend the state’s attorney for giving us an example of what is possible when prosecutors are actually fair. What about you? Or are you content to let the clowns win? Richard B. Muhammad is editor in chief of The Final Call newspaper. He can be reached through www.finalcall.com and at editor@finalcall.com. Find him on Facebook at Richard B. Muhammad and on Twitter: @RMfinalcall. His website is www.richardmuhammad.com. Catch his weekly segment Sundays at 8 a.m. CST on TouchFM.org.